Representatives from businesses who took part in the previous Y-Accelerator programme. Entrepreneurs, teams and organisations with enterprising ideas are being urged to join an intensive programme of free business support, development and mentoring due to start next month. The Y-Accelerator offers the city region’s future business leaders a three-month fast-track programme of expert advice, mentor support and specialist workshops, as well as the chance to pitch to a panel of high-profile investors including Mercia Technologies, Angels Group, Jenton Group and UK Steel Enterprise. The programme is delivered by the Sheffield City Region Growth Hub, Rotherham Investment and Development Office (RiDO), Sheffield Hallam University and an entrepreneur in residence from Gripple Ltd. It will be run by a team of business specialists from the public and private sector. 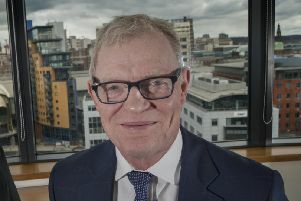 Gordon McRae, special projects manager at Sheffield engineering firm Gripple, said: “Y-Accelerator’s aim is to create new businesses for the economic benefit of the region. The investor pitch event that concludes the programme is a unique opportunity to garner interest from major businesses. “We’re looking for people, teams and businesses who have an innovative idea and the aspiration to build a strong new business. Delivered through tailored one-to-one and group sessions, the Y-Accelerator programme’s network of advisers, mentors and businesses will provide insight and expertise. The 12-week programme runs from November to February and includes business modelling, expert advice, mentors, workshops, market research and individual support to help 10 projects build a strong customer proposition and financial model as well as learn to communicate the business value to customers and investors. UK Steel Enterprise, a subsidiary of Tata Steel, is offering a £1,000 prize for the winner of this year’s programme. Also, Design Futures, a product and packaging design consultancy within Sheffield Hallam University, is offering services worth £2,000. The Y-Accelerator 2018/19 is inviting applications until October 31 through the Sheffield City Region Growth Hub portal. For more information, please email: growthhub@sheffieldcityregion.org.uk, visit www.scrgrowthhub.co.uk/y-accelerator, or call 03330 000039.